May your honour accept my humble Namaskar. Your honour is well known as the Iron man of India but I know that you are the most practical man who can take things as they are. With this in view I venture to approach your honour for submitting the following few lines for your consideration and necessary action. Funds are being collected to commemorate Mahatma Gandhiji in a fitting manner and I beg to suggest that the same may be done in a Gandhian way and not otherwise. Gandhiji's whole life was dedicated to the service of humanity at large with special interest for raising the moral standard. His later activities showed that he was equal to every one and all the people of the world knew him more as the spiritual leader than a mere politician. Devotion to Godhead was his ultimate aim and when I say that his sacred memory should be perpetuated not in the ordinary way but in the Gandhian way, I mean that fitting respect to his memory will be done in the following manner. 1. In the midst of his multifarious duties, Gandhiji never missed to attend to his Ramdhun Kirtan meeting. This is one of the soundest methods for the culture of devotion to God. In the opinion of 'Srimad-Bhagbatam', one who is imbibed with the devotion of Godhead is also endowed with all the good qualities of the gods. But one who is not a devotee of Godhead, has not any value for his qualities because he utilises his so called good qualities for ulterior purposes. As such the easy way to raise the moral standard of people in general, is to make this 'Samkirtan' movement more popular all over the world by philosophical discourses based on reasoning and moral and ethical codes. The Vaishnava Acharyas especially Lord Chaitanya and his six Goswamin disciples give us ample opportunity and scope for this work. 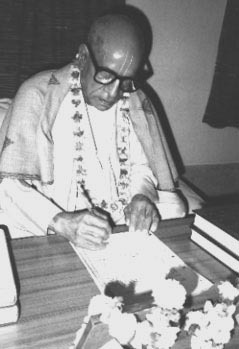 Lord Chaitanya first inaugurated the Samkirtan or Ramdhun movement and the later Goswamins supported it by scholarly philosophical synthesis. The six "Sandarvas" by Sreela Jiva Goswami are marvelous in this respect. 2. The second item is to take up the temple entry or temple worship movement. This is, in the real sense, a theistic cultural movement and the facility or opportunity shall be open to every one whatsoever he may be. All the past Acharyas accepted everyone who desires to offer his respect to God inspired by transcendental love and devotion. We can support this movement of Gandhiji on the authority of Shastras. There are thousands and lakhs of temples all over India but they are not always properly managed. Some of them have become the positive dens for undesirable activities and most of the owners or trustees of such temples do not know how to utilise these sacred buildings. Neither modernised gentlemen have any interest for these neglected theistic institutions. Originally the aim of these temples was to diffuse spiritual culture in every quarter. These temples or theistic institutions should therefore be reorganised as the centre of spiritual culture according to authentic principles as laid down in the scriptures like Bhagwat Geeta. Harijan) is as important a man as the knight of the king. So 'Harijan' movement should be strengthened more scientifically to turn every person who is now 'Mayajan' into a 'Harijan'. The 'Mayajan' is a word which is applicable to a person who is ordinarily engaged in the service of materialistic pursuits, whereas the 'Harijan' is the person whose main business is to attain the perfection of human life, as Mahatma Gandhi did, by spiritualistic realisation. This movement should therefore be conducted under strict disciplinary methods as prescribed by the 'Mahajanas' or the 'Harijan' of accredited merit. In such a movement we shall have full co- operation of the 'Sadhu' community in India. 4. The fourth item is to organise the much discussed caste-system as a solution of natural divisions of the human beings all over the world. Nationalistic division of human races is artificial but scientific division of the caste system as envisaged in the Bhagwat Geeta is natural. We shall have to pick up Brahmins and others not only from the Indian people but from the peoples of all over the world. The vitiated caste system of present India is never sanctioned by the scriptures. But the caste system is made by God according to quality and work of the subject and it was never designed for the benefit of accidental birth right. Thus whatever is made by God cannot be destroyed by man. Destruction of the caste system as contemplated by some exponents, is therefore out of question. By the modes of Nature different persons are imbued with different qualities and the scientific way of division of human society, from the qualitative aspect, by the caste system is quite natural. But the basic principle of such caste system is to serve the plan of Godhead and by doing so the four orders of caste system make a headway by the cooperative method. When such spiritual progress is definitely made, the materialistic progress is automatically effected as a matter of course. That makes a real classless society. The above four-fold Gandhi movements, if done in an organised, scientific way supported by all the authentic scriptures of all religiosities, will bring in that tranquility of peace and respite of all harshness and bitterness of the present world, which we have longed for till now. I wish to organise a spiritual society for the above movements and therefore I seek your active help and support for this. The immediate need is to start an organisation centre in a suitable place preferably in New Delhi under your direct supervision and to train up a batch of young men for this transcendental service. If possible to conduct a monthly magazine in this respect for propaganda work. If your honour will allow me an interview, I shall be glad to explain the whole idea personally and let you know how the scheme can be given a practical shape for subsiding the general unrest all over the world. Such an organised movement shall be the panacea of all social maladies. The State is giving help for so many man-made purposes and I pray that a sum of Rs 2000/-per month may be allowed for starting these Gandhian movements in organised form and that on authentic basis I think if your honour as a renowned practical man accepts my humble suggestion, it may be the Will of God, that the whole atmosphere of the present world calamities may be mitigated altogether. My humble self had the privilege of taking this training under the lotus feet of my Spiritual Master and I am confident to organise this work in a scientific way if I am helped by the State.